Marco Rubio often doesn’t show up for work. Instead of a pay cut or a demotion, he has been elevated to competing for the most important job in the world. Imagine how much better your life would be if you could take the same lazy approach to your work. Campaigning for president can cut into your free time. But Senator Marco “Ken Doll” Rubio has found a good way around the problem: he just doesn’t bother to show up for his job. A poor attendance record is one thing but in the case of Rubio, his avoidance of work is so glaring that newspapers and colleagues are calling for him to vacate his Senate seat so his state would be adequately represented in Congress. Considering that his state is Florida — where elected officials are not noted for veracity or scrupulousness — perhaps his being away from work isn’t such a bad thing. But that’s a different story. Defending his poor attendance record, Rubio claimed that voting isn’t the most important aspect of the job and that he wasn’t doing anything different from the other unqualified senator running for president. Rubio’s speechwriters came up with a novel defense of his poor attendance record: that voting is not an important aspect of the job. As usual with GOP candidates, reality contradicts his statements. While Rubio ostensibly serves on the Senate Foreign Relations full committee and subcommittee, Politico points out that he missed 52 of 106 hearings from 2011 to 2014. BOSS: You missed work yesterday. YOU: Now hold on a minute. The majority of this job is not walking onto the office floor and lifting a finger. BOSS: Gonna have to dock your pay. YOU: This illustrates the fundamental media bias against Conservative values. YOU: The right of seeing to it that nothing gets done. YOU: I knew it! You’re for Trump! 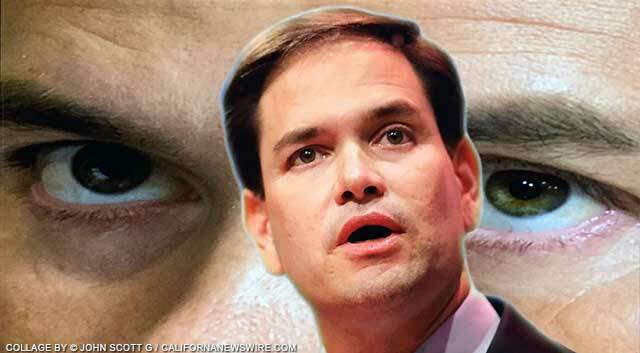 Senator Marco “lazyboy” Rubio has also demonstrated another labor-saving approach to campaigning. It consists of answering every question with a scripted response. It consists of answering every question with a scripted response. It consists of answering every question with a scripted response. And let us not forget that every query can be addressed with a reply that is pre-written. Many observers have noted that Rubio appears to have had his handlers compose a dozen pat responses for him to fall back on from time to time. Say, about one hundred percent of the time.